Two Cities Two Wheels: Get Me a Red Spotted Jersey! I had big plans to ride to church to help in painting the entryway tonight, but it got called off onaccounta the heat. Our church isn't air conditioned so we get a preview of Hades on these sweltery Sundays. 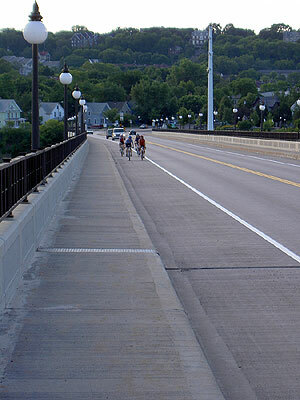 Anyway, I had read some other blogs talking about riding up the Saint Paul High Bridge, Ohio Street and Ramsey Hill and decided to go out for a ride. I've ridden (and walked!) up Ramsey Hill before, but never the High Bridge and I've only gone down Ohio Street. It may be too hot to paint but it's not too hot to climb some hills! I headed off down my usual Chatsworth route a little before 7PM. 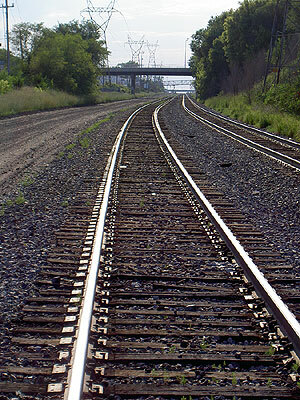 There were no trains in evidence and I went across the informal crossing. Chatsworth ends at Saint Clair. This is handy as the approach to the High Bridge is down St. Clair. This goes down a nice long hill into the river valley where you can build up a good head of steam. 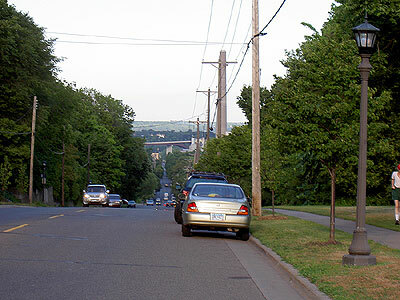 You can see the bridge in the distance from the top of the hill. There are some nice views in the last few hundred yards to the bottom of the bridge. 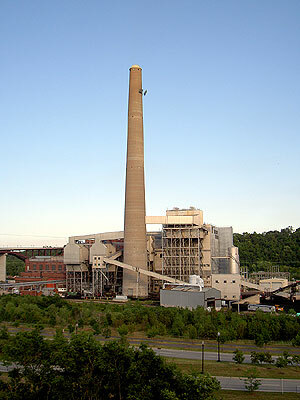 This is the big power plant right on the river. I got to the bottom (the north end) of the High Bridge and rode on up. It's a long, gentle slope with a pretty generous bike lane. I had no trouble with it but did stop halfway to take some photos. 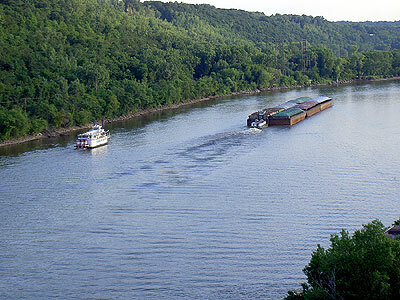 There was traffic in the river. 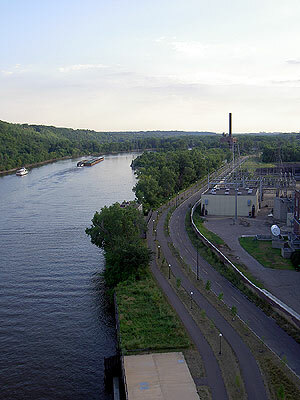 There's a good view of the bike trail right along the north bank of the Mississippi (the river runs east and west here for a few miles before turning back south). While I was taking pictures, four women came riding up past me. After I got to the top, I took a left and then rode down Ohio Street, a steep hill with lots of S-curves. I was roaring down like I was the Tour de France (actually, I never exceeded 31 mph) as what appeared to be a whole bike club labored up the hill. I felt sort of guilty. Going down is easy. I should ride up the hill too. But first, let's look around! 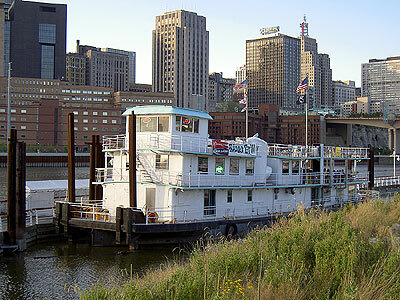 There's a floating restaurant moored on the Mississippi again! Yay! We used to be quite fond of the No Wake Cafe but it's closed. We'll have to come down and try the River Grill. Maybe I can get Karla to ride here. 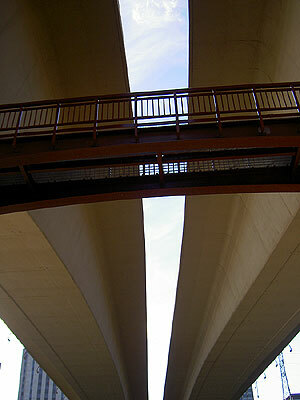 I rode under the Wabasha Street Bridge. Here's what it looks like. Having stalled long enough, I rode over to the base of Ohio Street and headed up. I used my small chainring and ground my way up. I've never been fond of hill climbing. It's kind of a demoralizing hill in that all those curves mean you can't see the top and even when you get to the top of the main hill there's a couple of blocks of upslope to Smith, the High Street road. Having made my way up, I stopped at the observation area at the south end of the High Bridge. 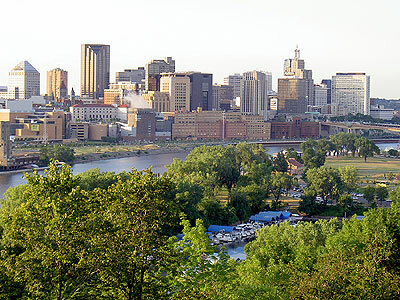 There's a nice view of downtown Saint Paul a little to the east. A mother and little girl arrived about the same time, from the other side (not having ridden up Ohio Street!) 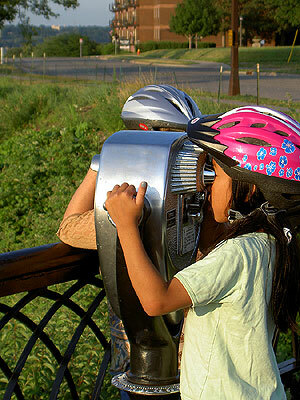 and I overheard Mom make a comment that she didn't know they had telescopes there, next time she'd bring a quarter. I rummaged around in my front bag and found a quarter and gave it to her, and the little girl, Nora, had a good look at downtown Saint Paul. 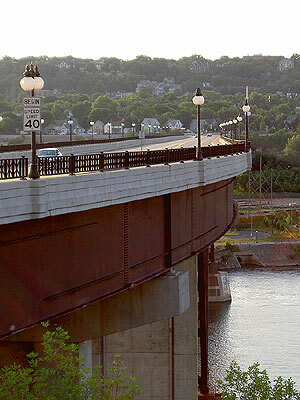 Here's a view of the bridge from the observation area. I rode down across the bridge. There's a surprising amount of broken glass in the downhill bike lane. Maybe the sun angle was picking it up. At the bottom, feeling manly, having ridden the High Bridge and Ohio Street, I rode the Ramsey Hill up to Summit, and made it! No old ladies on trikes with cats in their front baskets rode by me saying "on your left!" Last time I tackled the hill was right after working all day at the Great River Energy Bike Festival Time Trials and I'd just had a half-pound bison burger and two major beers and ended up walking the Marin up. This time, I rode! I'll have to get myself a red spotted jersey! At Summit and Victoria, the light was red, so I took a right and headed up Victoria to try something different. It parallels Chatsworth a few blocks east and gets across I-94 on its own bridge and crosses University on a traffic light. The neighborhoods are kind of transitional, some gentrification, some immigrants, some African-Americans. 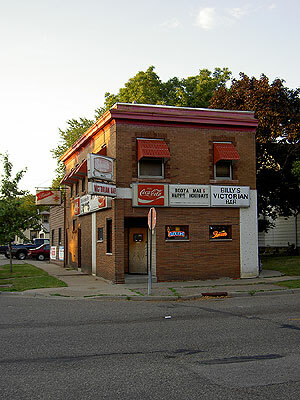 There are snippets of Old Minnesota, like Billy's Victorian Bar. It's hard to imagine a less Victorian-looking bar, but it is on Victoria in Saint Paul. It looks pretty Old Minnesota because of the Grain Belt Premium and Old Style signs out. Also, it has a sign for a Booya which I think of as a Minnesota thing. This one either happened three months ago or is coming up in nine months. I'll have to stop in here sometime for a beer. And I went home to delicious leftover tuna and spicy noodles and a couple of glasses of wine. I then felt ambitious enough to catch up on the blogging, hence all of tonight's entries. I have to say, this Atlantis is really fun. It makes cycling much more fun than my Marin, which means I want to ride around more, which means I get stronger, which makes it more fun, etc. It's a virtuous cycle. My mileage (17.5 miles tonight) and pace (11.5 mph average, largely due to farting around taking pictures etc) are pathetic compared to serious cyclists', but I'm having a great time. It's hard to tell how others experience their bikes, what combination of joy and discomfort they get, but I wish more people could have the fun I'm having now on this bike. We'd all be out there. In my opinion you are a serious cyclist. I say, "Screw the average speed." The important thing is that you are out on a bike. I'm being nice here too, because I am extremely jealous over the Atlantis. The jealous part of me says, "You aren't serious cyclist, give me the Atlantis!" Oh well, hopefully I will be able to have my own someday. Nice and thoughful blog by the way.